Perhaps no other science is more misunderstood than the simple spiritual science of Yoga. In India, Yoga is understood to be something that is out of the way. A Yogi is thought to be a queer being, living on herbs and fruits in some remote forest or in a dark cave in some distant mountain range. In the West, Yoga is quite often associated with some magical performances such as a rope-trick, or some physical acrobatics, standing on the head, for example, or some feats of endurance like prolonged retention of breath, doing the so-called Jiva Samadhi or remaining buried underground for several days, which is done by proficiency in Kevala Kumbhaka. It is also supposed that by doing some particular Yoga practices one could fly in the air without wings, or do anything that is odd. ‘Every Man’s Yoga’ is ideally suited for the general class of readers who are interested in spiritual topics. It is not a textbook for the advanced students of Yoga. This is an ideal work in the sense that it answers to all types of temperaments that are inclined to the spiritual path. It seeks to dispel the pet notions which glamour Yoga as something queer and sensational. It presents a great science in a very simple, lucid manner, while expertly analyzing the different aspects through a comprehensive outlook. Perhaps no other science is more misunderstood than the simple spiritual science of Yoga. In India, Yoga is understood to be something that is out of the way. A Yogi is thought to be a queer being, living on herbs and roots in some remote forest or in a dark cave in the fastness of some distant mountain range. In the West, Yoga is quite often associated with some magical performances such as the rope trick, or some physical acrobatics, standing on the head for example, or some feats of endurance like prolonged retention of breath, doing the so-called Jiva Samadhi or remaining buried underground for several days, which is done by proficiency in Kevala Kumbhaka. It is also supposed that by doing some particular Yoga practices one could fly in the air without wings, or do anything that is odd. Asana and Pranayama alone do not constitute Yoga, though they are a part—and a minor part—of the science of Yoga. Even in Raja Yoga what is meant by Asana, or the third step, is the achievement of proficiency in any of the principal postures for meditation, i.e., remaining steady and at ease for a long time in one particular Asana while one practises withdrawal of the mind from the external objects for concentrating it on something to meditate upon. Asana as a science of physical culture comes under Hatha Yoga, and though the regular practice of the various cultural poses are useful for maintaining good health and youthfulness, the Asanas do not by themselves necessarily ensure the spiritual development of the practitioner. Pranayama, likewise, has a significant bearing on the mind, and by regulation or control of breath, one could achieve a measure of mental steadiness and quiescence, good health, and possibly longevity, too, but Pranayama is only an aid for meditation and spiritual unfoldment, and should not be made into a fetish, or taken as a means for gaining control over the physical laws, the law of gravitation for example, the factual validity of which remains to be demonstrated. Once an adept in Yoga, so the story goes, approached a saint and said that after several years of rigorous practice of a certain kind of Pranayama he (the Yogi) was now able to master the gravitational pull at his will and could at last cross the river near his village, sailing over it as it were, without the risk of getting drowned in the process or even wetting his feet. The saint replied that the Yogi had, alas wasted his precious time all these years, when one could indeed easily cross the river any day by paying two cents to the boatman, and, instead, the Yogi could have attempted for achieving mastery over his mind and aspired for God-realisation. The idea is that standing on the head by itself does not make one a Yogi. Yoga is essentially an inner process. It is not a religion. It does not pertain to the physical aspect of renunciation or running away from the world. It is primarily a way of life. Yoga is defined in various ways. The Gita says, proficiency in action is Yoga. One could be a Yogi while yet leading an active life in the world—though enormously difficult it is to constantly maintain the spirit of Yoga surrounded by worldly influences and impelled by negative Samskaras or cumulative impressions acquired in the past. One has to cultivate a right sense of evaluation, a rational and correct perspective, an insight into the nature of things. The world of senses, which we feel and see, enjoy and suffer from, is not everything. There is something beyond all that is apparent. Life is not entirely matter-bound. There is something higher than the call of mundane duties, something greater than temporal values. We have to rise above the pairs of the opposites and acquire control over their impacts on our minds, such as through inordinate likes and dislikes, undue elation over material gains which cannot last long, or a negative state of depression due to a personal loss or suffering that is an outcome of the association of our body and mind, our individuality, with the temporary state of existence. Thus Vedanta says that one is not the ‘doer’ or the ‘enjoyer’ but a silent witness, the Atman or the immortal spirit within. It is the body and the mind that act and enjoy and suffer. The process of Yoga enables our conscience to guide our conduct and action, helps us to do our best and then leave the results in the hands of the Supreme. One suffers on account of a negative strain of sensual attachment to objects or individuals, an attachment pertaining to one’s individuality. One would, therefore, be in a much better position to perform one’s duties well if one trained oneself to be a useful instrument for the working of the will of God, i.e., performing action without any selfish motivation or expectation or material gain as an exclusive objective of one’s action. Of course, this requires a good deal of evolution in spiritual life. Detachment, non-expectation, efficiency, initiative, perseverance, application and offering of the results to God—these should be the guiding factors of one’s active life. Only then could action be called Yoga. In the path of devotion, emotional integration is called Yoga. A sense of oneness with God is Yoga. Shedding tears for the vision of God is not Yoga, or seeing the appearance of an image associated with any divine incarnation cannot also be called God-realisation. God is not confined to an image. He is in every image and yet beyond all. A particular deity is not the only God, a particular concept of the Father in Heaven is not the only aspect of the ultimate reality. God-realisation is something infinitely greater than merely seeing some visions during meditation or seeing a divine form in dream, which is but a result of concentration—the appearance of an impression from the subconscious on the screen of the conscious mind, or in the dream state, caused by prolonged thinking on a particular form. Mere physical concentration of the eyes would enable one to see lights or sparks on the retina. It is not indicative of realisation. Even a worldly man could dream of a particular form drawn by the force of physical attraction. Lights could manifest according to the constituents of one’s Tattvas or qualities. One has to see if the so-called vision of God has indeed completely revolutionised one’s inner being and one is thus completely changed from a worldly-minded individual to pure spiritual being. If that is so, then it is a great achievement, indeed. If there is no inner change, then such visions are of no greater importance. We hear so much about the ‘performance’ of Samadhi or ‘seeing’ God by devotees. Let us not dupe ourselves. Spiritual realisation is indicated by the quality of life, the purity of character, the cessation of desires, perfect mental equipoise, radiant, infectious happiness, and clarity of vision into the nature of things, in short, a life that is well above the mundane state of existence. Emotional fervour is not Yoga. One who has complete mastery over one’s emotions and yet is keenly responsive to the good graces of life and is moved by the sufferings of the world might be said to have the heart of a Yogi. The Yogi’s heart is not barren. It is intensely human and humane. It is aware of the faults of the world, but does not mock at them or has any superiority-complex over them. The heart of a Yogi tries to understand the problems of others and is ever eager to be responsive in helpfulness. It is not a bundle of emotions, fancies and prejudices. It is not impulsive. It is detached, yet full of love. It adores the deity of its choice but has equal respect for all other forms of God, seeing the same deity in them all and also in all the creations of God. It does not confine itself there. It soars beyond them. The bigoted Bhakta is at best a Purohit or a temple priest or a rosary-telling householder, but not a Yogi or even a man of religion or one of spiritual realisation. In the path of Yoga, bigotry should be totally absent. Yoga begins where mental narrowness disappears. As already said, Yoga is primarily a concern with one’s inner being. Control of the modifications of the mind is Yoga, says Patanjali. Balance of mind is Yoga. Steadiness in the consciousness of the reality behind appearance is Yoga. A knowledge that is free from oscillation or hypothetical conjecture, a knowledge that is not dependent on the sense-perception, is the outcome of Yoga. ‘Every Man’s Yoga’ is ideally suited for the general class of readers who are interested in spiritual topics. It is not textbook for the advanced students of Yoga. For them there are other works of Swami Sivananda and others, which go into details about the respective aspects of Yoga. This is an ideal work in the sense that it answers to all types of temperaments that are inclined to the spiritual path: It seeks to dispel the pet notions which glamour Yoga as something queer and sensational. It presents a great science in a very simple, lucid manner, while expertly analysing the different aspects through a comprehensive outlook. In the first chapter the reader is reminded of the spiritual purpose of life and what should be nature of one’s aspiration through which one could find real happiness. 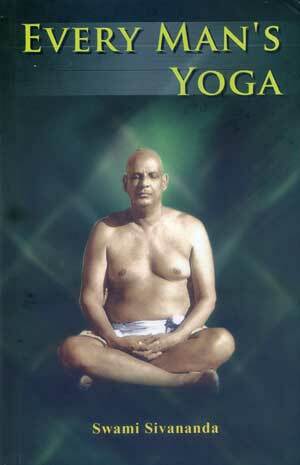 The second chapter is an elaboration of the first, giving the essential points concerning the Yoga way of life. Chapters three to six deal on the four major aspects—Raja Yoga, Karma Yoga, Bhakti Yoga and Jnana Yoga. These do not necessarily give all the points concerning them, but help to acquaint the readers with a fairly adequate knowledge of the essential features of the four main paths. After a study of these four chapters, one could go in for detailed reading of the individual works of Swami Sivanandaji and others concerning each of the principal Yogas. The seventh chapter details the techniques and the benefits of most of the major Asanas and Pranayamas. The eighth chapter is on the various aspects of self-culture, with ethics as the base. The ninth chapter pertains to mental culture, analyses the characteristics of the mind and points to the ways for conquering the mind. The tenth chapter gives some general sidelights on Yoga, also touching on the law of Karma and the ways of gaining individual and collective peace. The eleventh chapter presents the Yogic view of religion, which is rather a concept of universal religion based on practical spiritual life. It also indicates the importance of the Yoga of synthesis or an integral development of the personality of man. The last chapter gives a sweeping analysis of what has already been dealt with in this work, but in a new light and in a convincing manner, delineating the essential tenets of the Yoga way of life—a life that is not divorced from normal avocations, but is harmoniously attuned to the call of the infinite spirit, a life that is ultimately meant for Self-realisation. We trust this work will be found useful to all students of Yoga.